Confirming the rich biodiversity potential of the Western Ghats biodiversity hot spot, researchers have identified and described a new Stone Loach from Krishna River in Northern Western Ghats. The new fish which is named as Balitora laticauda or Palmas Stone Loach, was spotted from three different parts of Krishna River in Satara district of the Indian state of Maharashtra. The finding which is published in the latest issue of the Journal of Threatened Taxa, claims that the new fish is different from all known species of stone loaches, in its appearance and characteristics. It has at least 7 most distinct characteristics from its closest relative B. mysorensis described from the Cauvery River in neighboring state of Karnataka in 1941. It has 10 traverse bands on the dorsal side while the caudal peduncle is deeper than that of the known, closely related species, says the research paper. The new finding adds a 19th member to the Balitora genus which includes stone loaches found in the hill streams of south and south East Asia. The researchers have spotted the fish from the stream of Krishna River drainage at Venegaon Village, Urmodi River near Nagthane Village and from Khodashi village. "I got one specimen (of the fish) through my student. By perusal of literature, I was surprised that the present species is quite unlike to its allied species. Meanwhile I came in contact with Sunil Bhoite, a naturalist from Satara and told him about the collection of more specimen from his locality. After one year, he caught some specimen from Urmodi river. After detailed study, I was sure it is new to science. ", said Dr. Shrikant Jadhav, Zoological Survey of India, Pune, who described the fish. Though the species is new to science, it was not so for the local people in the villages on the banks of the river. Locals call the fish ‘Palmas’ in Marathi which interestingly points to the appearance as well as behavioral characteristics of the fish. In local Marathi, ‘Pal’ means Lizard and ‘mas’ means fish, probably pointing to its lizard like appearance and its habit of clinging to the rocks in the river. According to Neelesh Dahanukar, IISER Fellow at the Indian Institute of Science Education and Research, Pune, who was part of the research team, Katkari tribes used to catch this fish along with other stone loaches to sell in the local market. “The species, however, is rare and is only seldom seen in the market”, he said. As per the research paper, the researchers have named the fish laticauda for its deeper caudal peduncle which makes it different from its close relatives found in India. Latus in Latin means ‘broad’ and cauda means tail. Despite getting attention from the scientific community, the life of Palmas stone loach may not be so easy in the face of rapid depletion of natural habitats in Western Ghats. Highly uncontrolled rapid developments are modifying the natural ecosystems, especially in the northern Western Ghats, posing severe threats to the aquatic biota, says Dahanukar. “Unless we take efforts for conservation of the habitats and keep a check on the various anthropogenic stressors, it is quite likely that several freshwater fish species will go extinct even before we know them and describe them scientifically. “, he says. 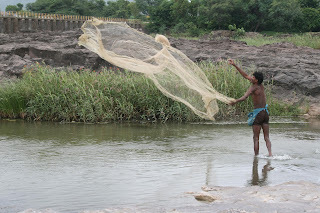 Pointing out that the fish lives in clear and swift waters of the streams with rocky bottom, the research paper also notes that the indiscriminate sand mining in the vicinity of the Krishna River can be a potential threat to the species. Moreover, there is an urgent need to conserve the depleting habitat of the river since the research team hints that there could be more aquatic organisms here which are yet to be scientifically described. "There is also scope to discover some species from the region on which we are working. ", said Dr. Shrikant Jadhav.